Published on Tuesday, March 4, 2014. Final version of the "Ceramics Kitten" by Catlanta. Image courtesy of the artist. If you live in the Atlanta area, chances are you have heard of - or been lucky enough to see in-person - the work of Catlanta. The artist has been making a big name for himself in the past few years with his colorful street art: small wooden cats that are painted in a variety of themes. Catlanta drops off the kittens across the Atlanta metro area, posts about it on social media, and then the hunt begins. The artist's followers scour the city in search of the prized artistic pets. In preparation for our upcoming Atlanta ACC show, we reached out to Catlanta to create a series of cats inspired by craft media. The designs and creations that Catlanta came up with are absolutely fantastic, and will be dispersed across town from now up to the beginning of the show. You can follow Catlanta's Facebook and Twitter pages to find out about new drop-offs. As an added bonus, anyone who finds a Catlanta/ACC cat and presents it at the box office will get one free entry to the ACC Atlanta show (don't worry, you get to keep the cat)! The cat image started as a doodle of my cat while I was still in college. Even though it was a rather simple image, I held onto it for years and eventually decided to use it as an image for a street art campaign. I wanted a simple, recognizable image that the city could identify and relate to, and the cats seemed to be the perfect candidate. What do you envision as the "life" of your cats? Do you want the finder to pass them on to family or friends, or is it something for this particular moment? I enjoy the idea that the cats have a home with the people that find them. I don't think too much about what happens to them after I leave them on the street, because it would make it that much harder to put them out. I honestly never know what will happen to a cat when it's left behind, but my hope is that it provides someone with a great experience and good memories whenever they look at it. I know some cats are re-gifted to others, and I also really like that people are out there sharing my work with friends and loved ones. When you started the project, what was your intention: Was it a way for people to get out and have fun, or did you see it as a way to get art out of galleries and other confined spaces and make it more approachable to people (or maybe both)? I can't say that I had much of an intention when I started this project beyond engaging with the public in a unique way. I like the idea of people leaving their houses and trying to find an area of the city that they may not have visited before. As the project has gone along and the quality of the cats has improved, I do see this project as a bit of a challenge to the way that art is presented and shared. Gallery shows are increasingly boring to me and fairly exclusionary to newcomers. By taking my art to the streets and offering it to the first people who can find it, I've leveled the playing field and made art fun. I feel like the direction that contemporary art is taking is doing more to exclude people instead of making it more accessible. I've had men and women ranging in age from children to grandparents go out and take part in these hunts and take home their very own piece of art. For some people, it's the first painting they've ever owned. In my opinion, we need more art that is fun and inviting if we want to inspire people to take an active role supporting the arts community. There are several people in this city who began as free art hunters who are now regulars at gallery events and making art of their own. The art world has made a joke of itself with overly conceptual pieces and prices that a lot of outsiders don't even care to give it a chance. I want to change that. In your opinion, what is the future of the arts community in Atlanta? I think the Atlanta arts community has a lot of potential. We have several organizations like Living Walls, WonderRoot, MINT, and others that are breaking down some of the barriers and inviting the outside community to get involved with the arts. There have been some fantastic exhibitions and artists coming out of this city in the past few years, and I think more and more people are seeing that it is possible to make it as an artist in this city as opposed to moving to places like New York City. I also think certain projects like the Living Walls murals, Flux Projects, and Art on the BeltLine are getting the public excited about art coming to their city. It's not a coincidence that the most popular art events in Atlanta don't happen in a gallery setting. I hope the city continues its support of public art in the future, I think we are finally making strides in the right direction and are setting ourselves apart by supporting our local artists as well as inviting some phenomenal international artists to our city to share their work. What is your most-read/favorite art or craft book? I don't know if this counts, but I love Chris Ware's graphic novels. The storytelling alone is fantastic, but I draw a lot of inspiration from his detailed designs and clean execution. I admire the time and effort he puts into his work, and push myself and my abilities even harder after reading his graphic fiction. 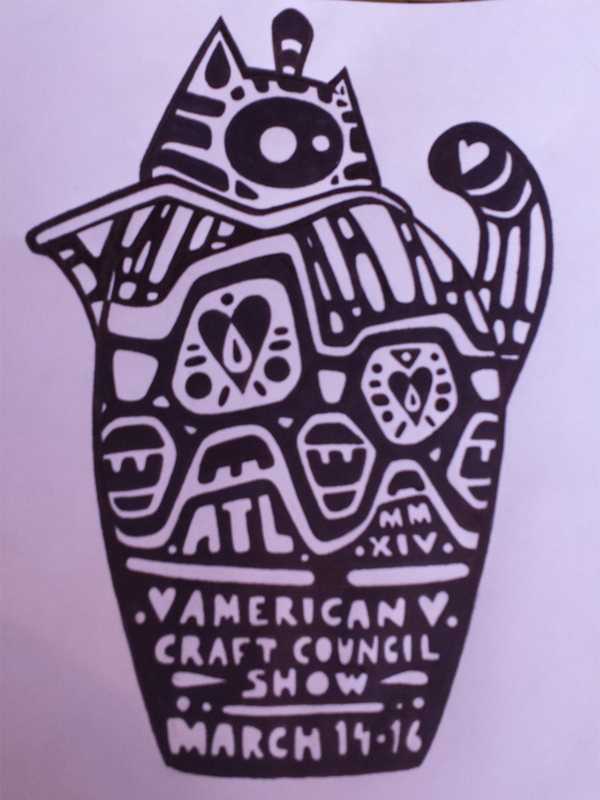 Atlanta metro residents: Be sure to stay tuned to Catlanta's Facebook and Twitter accounts to see where the next American Craft Council cats will be placed. 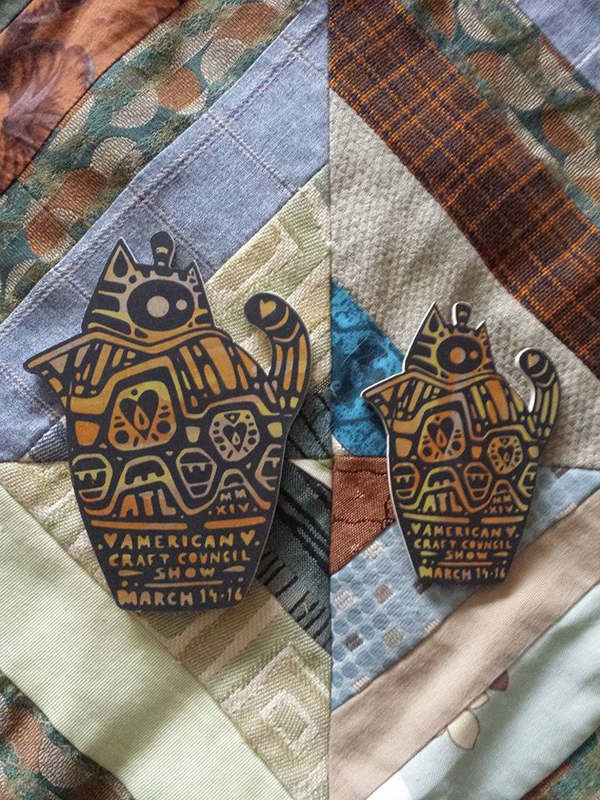 If you get your paws on one, you get one free entry to the ACC Atlanta show. Happy hunting! 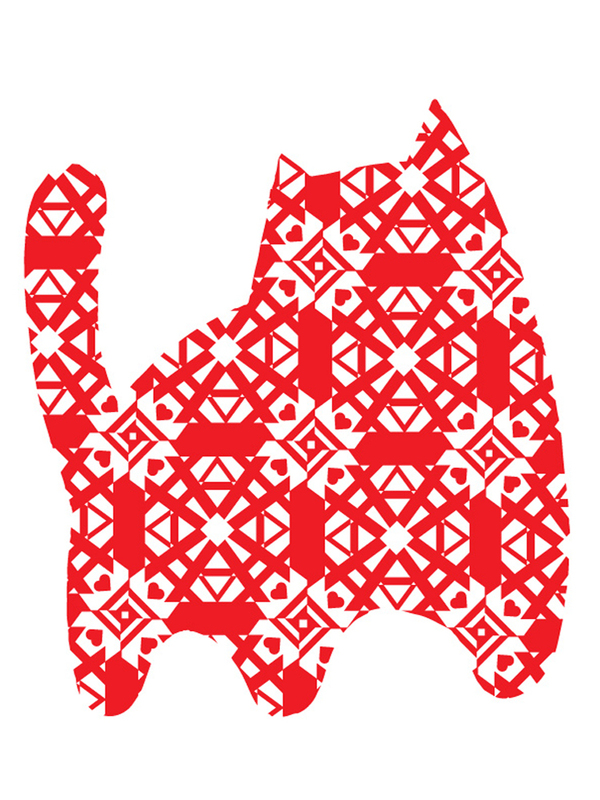 Design for the "Quiltwork Cat" by Catlanta. Image courtesy of the artist. Design for the "Ceramics Kitten" by Catlanta. Image courtesy of the artist.